Diggers Valley: 21 August 2010. The week beginning the 21st of August 2010. Two little steers went off to their new home this morning, so now we're down to a record low number of cattle: 53 head. Pigs are making a huge mess around the back of the farm. I find it very frustrating, since it's so hard to do anything about them and few of the pig hunters are any good at catching them. Some of the pig hunters are effectively pig farmers in that they'd like to maintain a population of pigs out in the bush for their ongoing entertainment and will deliberately leave youngsters, rather than eliminating them. Some people, we hear, release young pigs in the bush, for later hunting, which is both illegal and extremely annoying for those of us who end up having our pastures torn up. 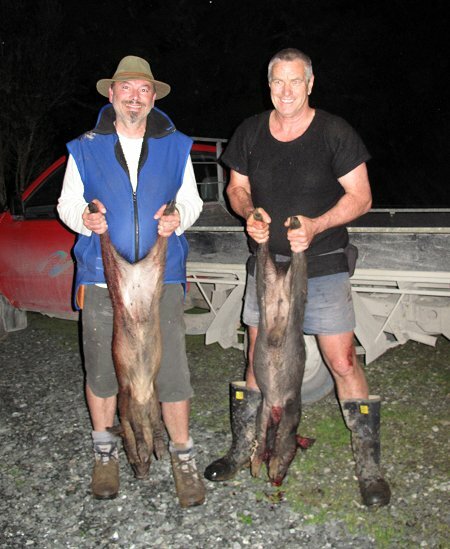 I approach pig hunting as pest elimination and if I can find some hunters willing to approach it in the same way, they'll be welcome to hunt here and will probably never run out of quarry. 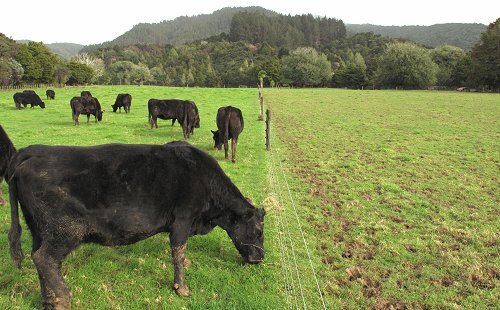 I've seen pictures of other people's cattle sitting like this, but never seen it amongst mine. I worried that this heifer had sustained an injury which was preventing her getting up properly, but she did eventually pop up onto her hind legs and seemed perfectly normal. I'm trying to train myself out of expecting disaster at every turn. 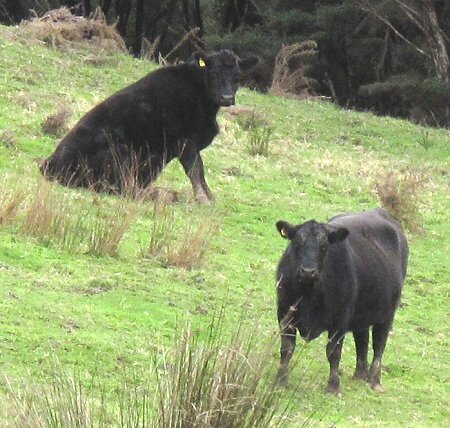 Some of the cattle were sitting under the Totara trees along the river bank. When she got to her feet, Abigail walked her way along under these branches to scratch her back. They like these sorts of trees for that reason. I don't like them when the cattle are sporting their heat indicators during mating, because it's these trees under which they rub the indicators off. 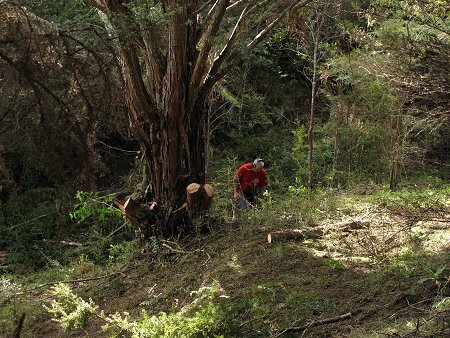 Around the other side of the hill Stephan was busily pruning Totara trees. 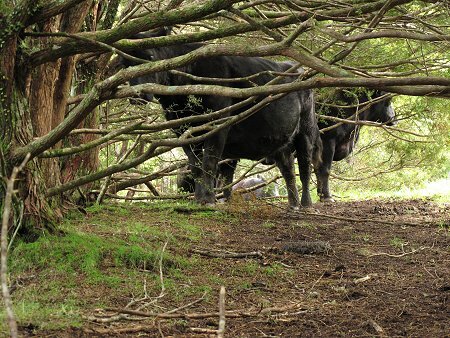 This one's branches were so low that the cattle had to walk right around the outside of it, in places too close to the steep places on the other side. The pruned branches now fill the hole below the tree, and there's far more room to walk along the slope. 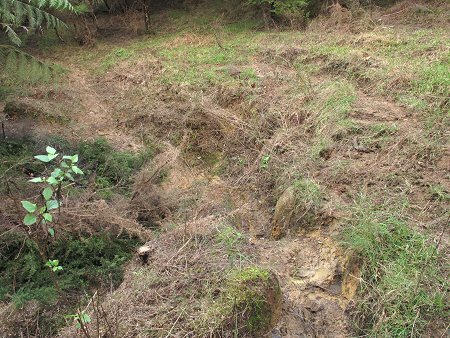 Here there were several small Totara and other scrubby trees, causing the cattle to trek along the top edge of a hole. Far better that they have more room to give the dangerous area a wide berth. 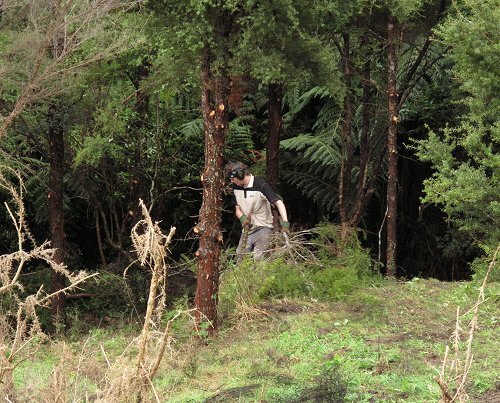 I left Stephan and clambered up through an area I don't remember seeing before, where I found a reasonably mature Lancewood. The cattle will eat them if they come across them, but they're not a favoured food, so where the seedlings grow away from usual cattle tracks, they sometimes make it past the sapling stage. 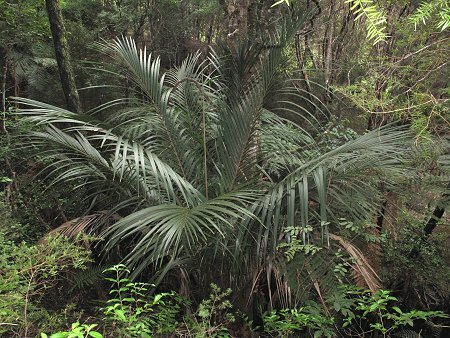 Above where Stephan was working, was a very steep area with some large trees and this beautiful Nikau palm. 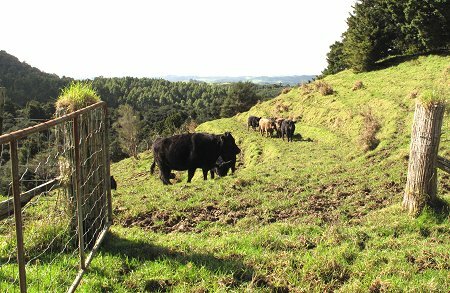 We will need to fence this gully off from the cattle, with its very steep sides - although the terrain is protection for the trees, I'd rather the cattle were out of here altogether. Over in the Middle Back, this Puriri is now quite striking in its obvious half-alive, half-dead state. The cattle have pared away the bark on the northern side, killing that half of the tree, but the southern side bark is less appetising, saving the tree from complete destruction. I'll put it on this summer's fencing list and see if we can get a protective fence around it. 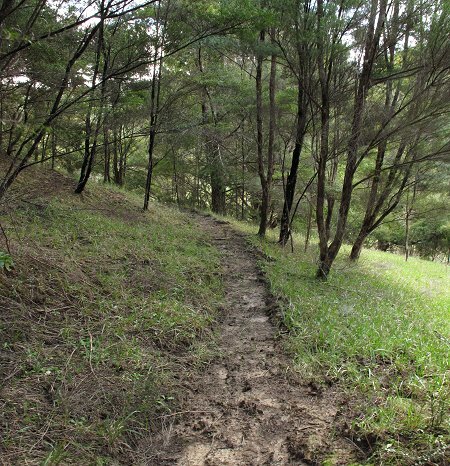 A cattle track through the trees in the Big Back Paddock. I've been reading a novel! I haven't had (or made) the time to do that for many, many months, and it has been a delightful experience. I spend so much time reading things I need to know about, for things I write, that I rarely feel I have time for reading for pleasure and leisure. 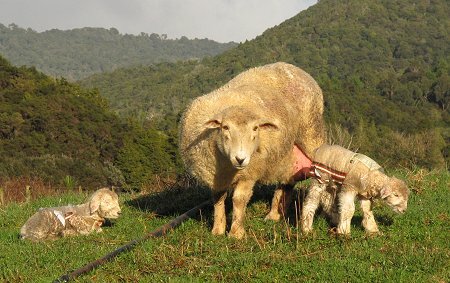 The young ewe gets rounder and more well-uddered by the day, poor uncomfortable animal. Just before noon, after standing around looking thoughtful for a few hours, the young ewe went into labour and delivered a lamb. I watched from a distance and saw that the lamb was able to raise its head and breathe, so left her to it. But then the ewe couldn't get up, so after I'd watched and waited for a little while, I went down to her to help. As I approached she struggled violently enough to eventually right herself, but then left her lamb as she ran off. As I hastily withdrew, I made some lamb-like noises which caused the ewe to look back in the direction of the lamb, and come back to investigate the little white wet thing. She wasn't terribly keen on the lamb though, and spent the next three quarters of an hour moving away from its attempts to have its first feed. Just before 1pm the ewe lay down and began to deliver her second lamb. 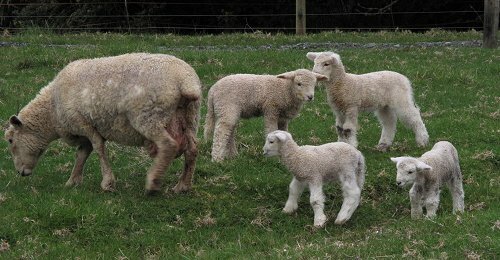 The first lamb is at the right in the picture. Things didn't appear to be progressing terribly well and with the binoculars I could then see why: the lamb's head and one leg were out and it wasn't moving any further. We had planned to build a lambing pen for this sort of eventuality, the sheep yards being a bit tricky to work on one's own, but hadn't got beyond talking about it. I attempted to catch the ewe, but with a sore shoulder I couldn't manoeuvre the crook very easily and her wool is too short to get a reliable hold and she kept slipping from my grasp. 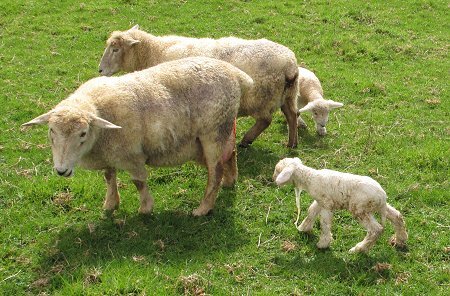 Meanwhile the lamb's head was bouncing up and down in an alarming fashion as she ran. I kept thinking of the people who ask on the Lifestyle Block discussion forum, "what do I do now?" when such situations occur. The answer is of course, "you do what you have to!" If Stephan had been here, we'd have been able to catch the ewe between us and if not, could have taken her up to the yards. However, he wasn't and wouldn't be home for some hours. If I didn't catch the ewe and pull the lamb out, the lamb would die. The ewe could survive with a dead lamb hanging out for the rest of the day if I couldn't help her, but while the lamb was still alive, the best option was to do whatever I could to get it out. I managed to start the tractor, grabbed a spare gate from the shed, wrestled a hung gate from its hinges at the end of the lane by the house and took the two, along with some ropes and straps to the other end of the House Paddock lane. I created a pen where I hoped to be able to herd the ewe so I could catch her without any more running around. Naturally the ewe was now highly suspicious of any move I made, and she was still paying some attention to the little wet lamb which kept following her around bleating; but eventually I managed to get some of the other ewes into the pen with some maize, so that the labouring ewe followed them in and I could wrestle her to the ground. The lamb was almost had-it by the time I got him out. Watching the lamb's head flopping around so violently during the last chase around the paddock, I thought he had already died, but eventually I saw his nose wrinkle a little just before the ewe went into the pen. He was completely limp when I pulled him from his mother, and showed little sign of starting to breathe. I vigorously massaged his chest and held his head up hoping that would encourage him to breathe. He took some getting going, but eventually began to breathe regularly and to hold his head up on his own. I think it was a pretty close thing and that if I'd simply left him lying after birth, he'd probably have died. It has always been common practice to swing newborns by their back legs to allow fluids to drain from their lungs to help them begin breathing. But somewhere recently I read that the practice actually hinders a baby's breathing because it causes the internal organs to put pressure on the diaphragm, and that any fluid drained is unlikely to come from the lungs. 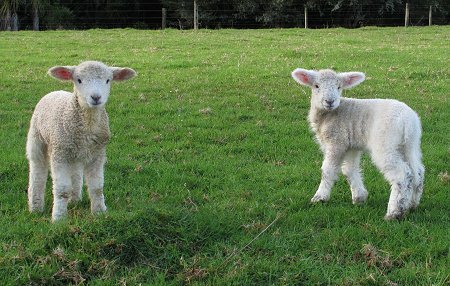 Lambs which don't get hung upside-down, i.e. any which are born and get on with their own lives, cope perfectly well with any residual fluid. So I didn't suspend my lamb. His head first appeared at 1pm and I dragged him out of his mother at about 2pm. I drafted Lamb out of the pen, since she was still there munching on maize, and left the young ewe to get to know her twin sons. An hour later both lambs were up and pursuing the udder of their unwilling mother, who was staying away from them as much as she could in a small space. I went into the pen, thinking I'd have to restrain the ewe to let her lambs feed. She wasn't going to let me anywhere near her, dashing back and forth to avoid me, but then for some reason she stopped. I reached my hand toward her and she sniffed it, and then I was able to touch her nose, a little scratch. This ewe has never let me touch her before. She continued to stand still as I spoke continually and quietly to her, while her two newborn sons began to snuffle around underneath her, moving toward her udder without her flinching and moving away. I don't know what happened, but it was a magic moment. I left the ewe to settle for another hour, but I was a bit worried about those two little lambs, born in a lot of mud and now in a pen which was getting muddier by the minute. I always spray the lambs' navels with iodine soon after birth, so when Stephan arrived home we went up to check on the ewe again and to treat the lambs. The ewe was still quite willing to have me approach her, so I helped the lambs find their way back to where they needed to be. Because she was so oddly quiet, and because I had brought a clean container with me, I milked 500mls of colostrum from her lovely big teat as she stood there. Because the ewe's teats are so large, I wasn't entirely sure that both lambs had fed properly, so gave both of them some of the harvested colostrum later on in the evening. The weather was pretty nasty and the lambs had consequently not had a chance to dry out, so when I'd finished feeding each of them, I slid them into pre-cut bread bags for the night, to keep the cold wind from whipping away all of their body heat from their wet wool. Vogel's Original Mixed Grain Bread lambs. Both lambs felt fat and warm this morning, and the ewe's udder was noticeably emptier on one side than the other. I removed the bread bags so the lambs' wool could dry in the warm sunshine. Mud, yuck. What a ridiculously wet August. 272mm of rain to this morning, which is about 180% of August's normal rainfall. However, talking with Aubin, who picked up the two little steers we sold the other day, it would seem that in some places the water tables have still not been returned to their normal levels since the drought. While this much rain is temporarily uncomfortable, it is no doubt necessary to restore adequate soil moisture before we get back into the normally dry months of the year. I've bred a shocking flock of sheep. Another lambing, another intervention. 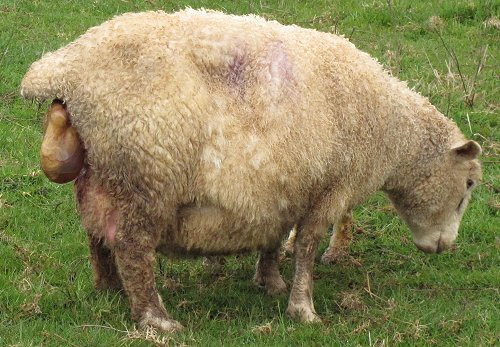 This is the tagged ewe, Dotty's triplet daughter and her due date should be 1 September. As I walked the cows down the lane to the yards for a copper injection, I could see she was in labour, so went back in half an hour to check how she was getting on. She wasn't. 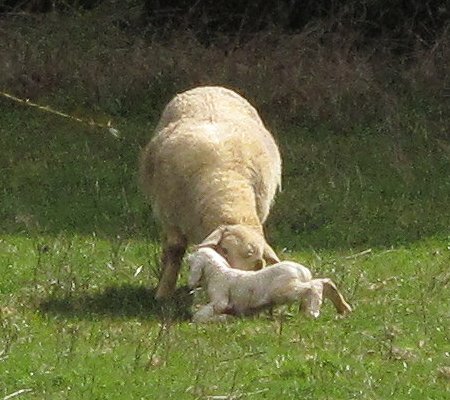 The lamb's nose and two feet were visible, but the tongue was dark and slightly swollen and the ewe's contractions didn't appear to be moving the lamb at all. We chased her into the pen and I pulled a reasonably large ram lamb from her. 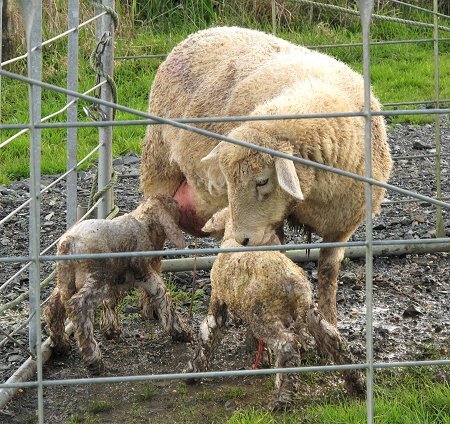 It was stuck because its elbows were caught and I had to gently pull each foot forward, so the lamb could come out. His head was a little swollen and he took a bit of encouragement to get going. Inside I found a smaller lamb, rather twisted around so that I couldn't get her up and out. Eventually I worked out that her head was off to the side somewhere, and when I manoeuvred it into position between her legs, I could pull her up and then out. 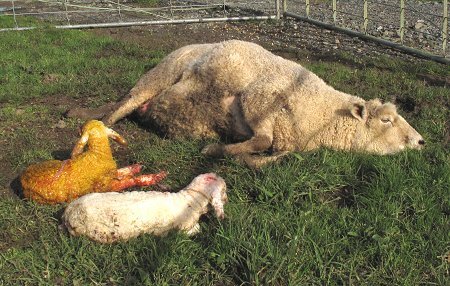 She's the yellow lamb in the picture. One-day-old lambs now without their bread bags. 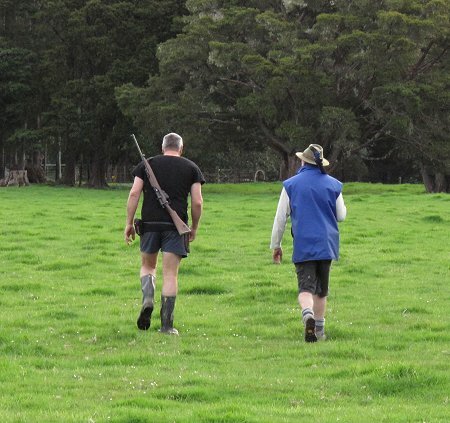 Stephan and Peter went pig-hunting this evening, looking for that mob of pigs I saw the other day. 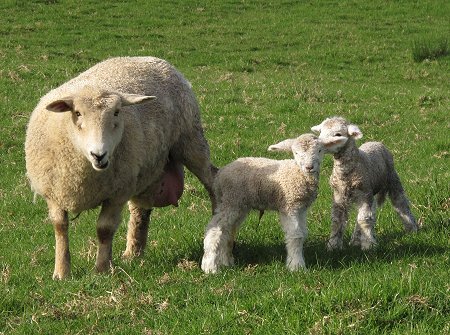 While I was standing looking at the ewe and her lambs in the makeshift lambing pen, there was an enormous bang from out on the farm, followed by some squealing and then another two loud shots, all from the .303 rifle Stephan was carrying. Then there was the relatively quiet phhhht of the .22 Peter took out. They arrived home in the dark, an hour and a half after they'd gone out, carrying two pigs! Stephan's first shot had knocked both pigs over, but neither was fatally wounded, which explained the following shots. I don't know how Stephan can hear anything any more; that was such a loud noise even at some distance. They gutted the pigs and Peter took them home to hang them, with promises of pork dinner in a few days time. The cows spent last night in the Pig paddock after their copper injection, because I didn't want to walk them past the newly lambed ewe at the top end of the House Lane. Because there are so few sheep on our farm, the sheep and cattle rarely see much of each other and neither group is quite certain about the other. The cows have now had three copper shots during the winter, so they won't need another one until sometime between calving and mating. I can't quite decide if they've noticed any reduced discomfort with the new type of copper I'm using. I suspect some of them will always furiously waggle their heads in the race whenever I approach with a needle and a pack of something blue. A couple of readers have requested that I stop surprising you all with ghastly pictures, because sometimes people are eating while reading. Here then is a gap before the next picture of a lambing ewe. If you don't want to read it now, or at all, click here to go past. Lamb stood around on one little patch of the paddock outside the house all night - I could see her in the moonlight when I checked. Just before 8am she went into labour and produced a ewe lamb. 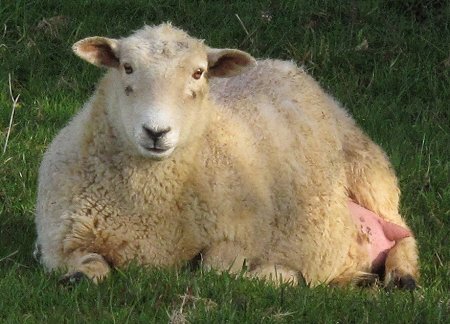 But the second one, to ensure that we had a perfect 100% score for lambing intervention this year, came out improperly positioned for an easy birth and consequently got stuck. This one, like the young ewe's second lamb, had only one foot and the head presented. A lamb probably could be born like this, but it would take a long time and in this case, with the membrane bag unbroken, the lamb might well be dead before it was born. I pulled the lamb out and all seemed well - except Lamb spent half the afternoon battering it away from her, in between snickering to it in an affectionate manner while licking it clean. Strange animal. The cows spent a bit longer in 5d than they should have and have done a very good job of cleaning it up. They were quite ready to come through the gate to 5c. The two biggest ewe lambs now have some frolicking friends. The young ewe's two ram lambs have had a couple of days of good feeding and are now jumping out of their skin with surplus energy. Such a lamb looks like it is receiving electric shocks, making it jump straight up in the air repeatedly. I doubt they can help it, and they're very funny to watch. Nephew Simon offered to come and help around the farm for a while before commencing post-graduate study, which we gladly accepted. He and Stephan spent most of yesterday continuing the work Stephan has been doing in the Big Back, filling dangerous holes. Today they carried on. This is a Totara. The brown area around it is the previously shaded area under its lowest branches, which might now grow some grass. It's now much easier to walk past this tree than it would have been before. 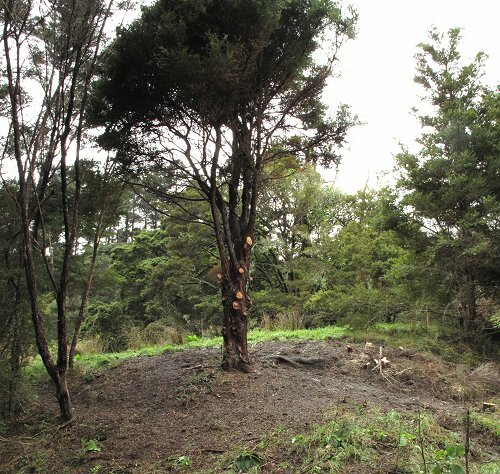 In this part of the country Totara grow like weeds, anywhere Manuka and Kanuka grow, but they're nastier to work with because their leaves are so tough and sharp at the ends. 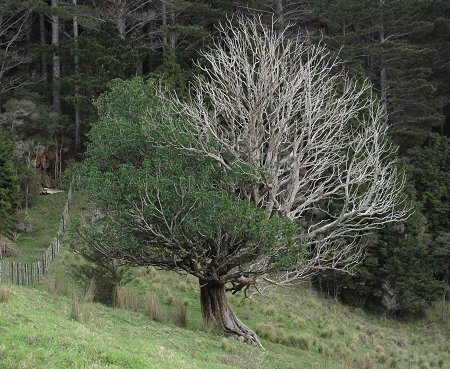 However they do make fantastic shelter trees: stand under a Totara in heavy rain, and often you'll remain entirely dry. 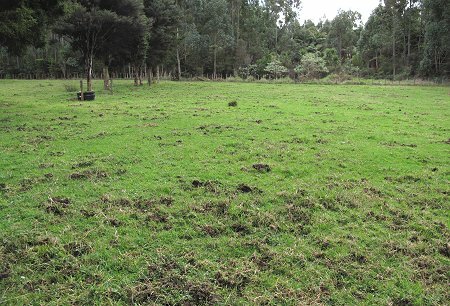 Those very useful attributes can be retained without their taking up so much pasture space, with a bit of judicious pruning. I almost didn't see this discarded Koura skin as I walked across the stream on my way home. It was sitting on the sandy bottom in a little back-water in the crossing. Back at home Lamb's lambs weren't looking very good. It would seem that Lamb doesn't have sufficient milk this year for some reason. I warmed up the little bit of colostrum I had left over (in the freezer) from the other day and fed it to them to keep them going, and when Stephan and Simon finished for the afternoon, we shot into town to buy some lamb milk powder. I'll have to at least supplement (if not fully feed) them to keep them going. 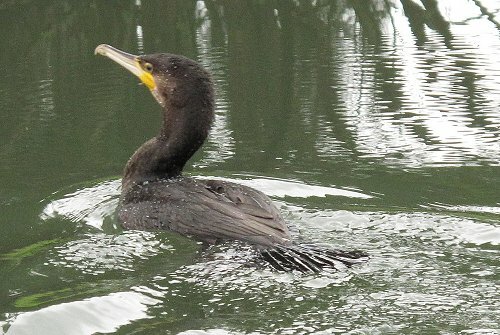 Just before we left, this Shag appeared at the edge of the pond and didn't seem to mind my gradual approach with the camera. When it could stand my proximity no longer, it flapped into the water and powered away to the far shore.